I bought myself a big bag of the beautiful copper colored reflective fire glass because I so wanted to match it with coppery and gold colors of resin and glitter, in my latest resin geode. This small 8 by 8 inch piece is completed on a canvas panel and fitted to a black wooden frame. I used glass glitter in chocolate and gold, resin in copper, gold, color shift black/gold and ivory, and glitter in copper and gold. The piece was highlighted with accent lines in gold and black. I had glued the glass glitter in place before adding the resin layers, but it really didn’t have enough dimension from the surface and the resin tended to run into and even over it, so I had to add more glass glitter on top into the wet resin. The results of the chocolate layer closest to the glass center weren’t as distinct as I would have liked. I learned to either coat them in a clear coat before adding the other resin, or to sprinkle them on top of the wet resin instead. 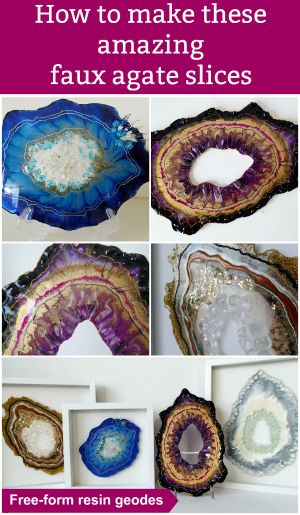 In the picture above you can see a good representation of some of the products I used in this resin geode. I am still undecided whether I prefer it when the bands of color blend or when they are kept more distinct. I think perhaps, like in nature, it looks good when there is a combination of both in the same geode. I have a quick video showing this piece where I go totally over the top and squeal a bit about how glittery it is. Embarrassing! But worth a look anyway. This one is for sale in my Etsy shop here. 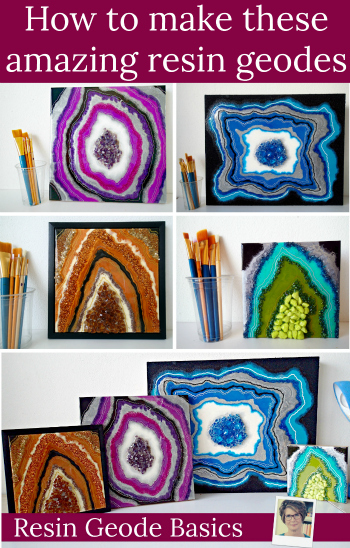 Let’s make amazing geode art together. Register with the site and we’ll let you know when there are new articles.